All Metroid: Samus Returns amiibo details and how to unlock them via N2 Elite? You are here: Home › How-To Guides › All Metroid: Samus Returns amiibo details and how to unlock them via N2 Elite? In this article, you can know all informtaion about Amiibos for 3ds game Metroid: Samus Returns. Plus, you will know a single amiibo emulator support all Metroid: Samus Returns Amiibos. This amazing classic game will come to the Nintendo 3DS on September 15, 2017. How many amiibos: Metroid: Samus Returns is going to be compatible with four amiibo. People can use the two Super Smash Bros Samus figures, as well as the two specifically made for Metroid: Samus Returns. Now, thanks to Nintendo’s Japanese website, we know what each figure will do when scanned into the game. Each of the amiibos will unlock one immediate bonus in Metroid: Samus Return, as well as one reward you can access after beating the game once. The standard Samus amiibo, from the Super Smash Bros. line, will give a Missile Reserve Tank that will automatically refill your missiles once when it runs out as you are playing. After you beat the game, it adds concept art to the Gallery. The Zero Suit Samus Super Smash Bros. amiibo will grant an Energy Reserve Tank that will restore your health once automatically if it hits zero while playing. It also adds a sound test to the Gallery after you beat the game. The Metroid: Samus Returns Samus amiibo gives players a Aeon Reserve Tank that will restore Aeon once if it runs out while you are playing. Once you beat the game, Metroid II art appears in the Gallery thanks to this figure. Finally, the Metroid amiibo unlocks a Metroid Marker that shows you the next one closest to Samus in-game. Once you beat the game, it unlocks a Fusion difficulty level that starts Samus off in the Fusion suit and is supposedly more challenging. How to unlock all 4 Metroid: Samus Returns amiibos on Nintendo NEW 3DS? You just need one amiibo emulator called N2 Elite. N2 Elite is sold as a game cheating product, called previously Amiiqo, an name probably too close to the original targeted game Amiibo. N2 Elite is working on NEW3DS, Wii U and Nintendo Switch, moreover, it is also supporting the 2DS, New 3ds and Wii U consoles. But it is not a flashcard like the R4 3DS or Sky3ds+, it can not play any ds or 3ds games on our Nintendo consoles. What it can do? Let me tell you here. N2 Elite or Amiiqo V2 is a NFC toy emulator currently supporting all existing Amiibo™ figurines, it collects figurines and keeps them safe. Like the old Amiiqo, N2 Elite is comes preloaded with 10 demo figurines and has the capacity to store up to 200 of them. Scheduled to come from Amiiqo are features such as, added compatibility, cheat system and new transfer/control methods & apps.To transfer your amiibos, an Android application is available and requires an NFC-enabled Android smartphone. 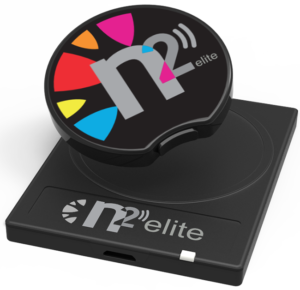 If you do not have a compatible smartphone, do not panic, the N2 Elite USB Reader is also available in order to transfer your amiibos from a computer. It has he following features.